Any movie that opens with an artistic abstraction of a body falling to signify someone jumping from one of the Twin Towers can't hope for greatness, but the shamelessness of Stephen Daldry's Extremely Loud and Incredibly Close is breathtaking in its outrage. In fairness, it was always going to be this way. An adaptation of the hideous book by Jonathan Safran Foer, the worst, most self-satisfied writer in America today, EL&IC does not so much process the horror of September 11 and its bewildering aftermath through the eyes of a possibly autistic 9-year-old as use this blank protagonist to skirt any sincere approach to the tragedy. Oskar (Thomas Horn, discovered being robotic and eerily smart on Jeopardy's Kids Week) roams around New York seeking some sense of closure for his father's (Tom Hanks) death in the terrorist attack, especially concerned with finding what his father's mysterious key unlocks. The lad, afraid of subways, runs around the city with a tambourine so that we have something to irritate us when the soundtrack isn't dominated by Horn's monotoned complaints about things that make him nervous. Unable to process emotion, he intrudes upon the turbulent lives of adults dealing with their own issues and presses them to answer his questions. For a movie supposedly about coping with 9/11, Extremely Loud and Incredibly Close depicts a disgusting inability to deal with the realities of life and the manner in which banal sorrows do not cease with the occurrence of large-scale travesties. Slow-motion shots of a vase symbolically shattering and the shallow focus of Oskar's Asperger-vision mark Daldry's only major artistic contributions to Foer's godawful prose. No, scratch that, there's also the matter of the frenetically edited, swirling montages set to Oskar's speech when he grows frantic in his word diarrhea. All of this is set to perhaps the worst, least subtle score the great Alexandre Desplat has ever composed, a treacly mess of shameless strings and woodwinds that trade Desplat's gift for atmosphere for an Oscar-baiting, unsubtle mess. An all-star cast is utterly wasted, with the sole exception of Max von Sydow as the mute renter living in Oskar's grandmother's apartment. Von Sydow's magnificent face, stony yet expressive, is at once more contemplative and more youthful than the perpetual look of mild irritation on Horn's mug. The reason for his self-imposed silence is telegraphed from miles away, but von Sydow breathes some life into this picture, and his every gesture is to be treasured. But even he is weighed down by the oppressive, naïve sentiment of it all. This is one of the worst movies ever made, a patronizing statement that it's alright to move on delivered to audiences who long since have. 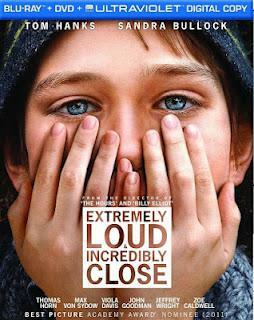 Like most movies about unfathomable tragedies as seen through a child's perspective, Extremely Loud and Incredibly Close is a moral cop-out, a simplistic means of tearjerking that engages its touchy subject on no level other than exploitation. I steered clear from this movie upon its original release over some of the furor that greeted it, but even distanced from the anti-hype, I still loathed this movie. This being a contemporary film, the technical specs are naturally robust. It's a shame they're in service to such drivel: to say that the sight of the burning Towers has never looked more crisp than in the 1080p transfer is not exactly a ringing endorsement. Nevertheless, the flat, depressed color schemes of Chris Menges' cinematography are reproduced clearly and cleanly. The 5.1 lossless mix evenly distributes Desplat's score and foregrounds the dialog with clarity. In the moments where Oskar's speech grows frantic, the surround-sound mix truly comes out, overwhelming speakers with his insufferable, cut-up ramblings. A smattering of features detail the making of the film from its general production to the discovery and instruction of Thomas Horn. Best of all, however, is Max von Sydow: Dialogues with "Renter." It's easily the best extra, if for no other reason that it gives an even longer view of one of the cinema's great actors, who is engaging even when standing still in the wardrobe department. Consisting solely of set footage, this feature gives an insight not only into Sydow's work as an actor but serves as a better making-of featurette than the actual making-of also included on the disc. Hell, it's better and more human than the film to which it is attached, which is admittedly saying nothing at all. The A/V quality and features do the film a service it does not deserve. Other than the chance to see von Sydow in his element and wholly at ease after six decades of doing this, there's nothing, including and especially the actual movie, to recommend this. For von Sydow fans, I'd say Rent It but don't bother with film. For everyone else, Avoid at All Costs.